The Vikings managed to play their home game last night, defeating Sacramento State. I wonder how often all four teams (Winterhawks, Blazers, Pilots, Vikings) have home games scheduled on the same night. NoPoNeighbor wrote: The Vikings managed to play their home game last night, defeating Sacramento State. In hindsight, the game could have been played last night. In fairness to those making the decision, they didn't know when or if the freezing rain would hit. Portland State is in a better situation with better access to public transportation (not as meaningful in adverse conditions but still helpful) and home crowds closer to 600 than 6000. I just hope they announce the new date soon, so I can book a planned trip to California. jake wrote: The Vikings managed to play their home game last night, defeating Sacramento State. home crowds closer to 600 than 6000. Geezaldinho wrote: 211 last night. not more than 30 or 40, some of whom might have been trying to get in out of the cold. They could have done that next door at the Rogue. Any word on a reschedule just yet? This whole postponement really doesn't favor the Pilots...playing 7/8 guys a night isn't normally a recipe for easily dealing with the addition of a game right into the middle of an already tight conference schedule! The decision to postpone the Gonzaga-Portland game last Saturday in Portland didn’t sit well with Few. There was some discussion about playing Sunday night but “Sunday was the bad one” for weather conditions, Few said. What a baby. Blazers and Hawks both postponed their games, but conditions were expected to be significantly better that the game could have been played in North Portland? Tough call that had to be made, and I don't envy Leykam for having to pull the trigger. There's zero reason for Few to be bellyaching about this. Agreed. Being that he is from Oregon, he should know better than to mess with these storms. I am glad that UP and the WCC put the safety of teams, fans and emergency responders (who didn't have to rescue stranded fans) and other drivers who really needed to be on the roads, first. The entire city was under a requirement for traction devices and chains.... I am not sure if the call from the city to "stay home" had been made yet, but the postponement was absolutely justified. I'm a Gonzaga grad, so I probably give Few more slack on this. I think it's fine to say they wanted to play, and they should have played. From there I think he should have stopped and the "puny" phrasing wasn't a good choice of words be any means. The reality is at 5pm (when fan's would have been making their way to the game), at 7pm, and at 9pm (when fans would have started making their way home) the weather conditions were fine to allow the game to be played. I do disagree that the actual conditions warranted canceling the game. What Few isn't recognizing is that a decision had to be made relative to a forecast that indicated a chance of a freezing rain event during the game. I do understand his frustration. Anyone would be frustrated to travel for a game, be ready to play the game, and then have it canceled. That being said, I don't think he should have vented that frustration as he did. Anyway, good luck tonight. Take down the Gaels. jake wrote: I'm a Gonzaga grad, so I probably give Few more slack on this. I think it's fine to say they wanted to play, and they should have played. From there I think he should have stopped and the "puny" phrasing wasn't a good choice of words be any means. The thing that "irks" me is the way I read "they" was referring to Leykam and UP, who i think were in pretty tough shoes from an exposure perspective if they went on with the game and things went south. Now, maybe "they" is more broad than Leykam and UP. I don;t know. Just seems a little unreasonable to go after an individual(s) rather than the situation generally being annoying. Completely agree. I think you can use Tuesday night as a good example of what the possibility was (albeit with snow not ice). High school games were canceled, not based on the existing weather, but on what the potential was. There were a lot of places in the metro are where the weather before and at tip-off times Tuesday would have been ok to play. However, when the games would have been over, the weather was worse than even the "worst" forecasts. If last Saturday had gone a similar direction, the post-game situation could have been a disaster. It was a tough spot to be in, and a tough call to make. I understand the frustration, and that it's a headache, but I don't think understandable frustration was expressed appropriately in that quote. I've had the pleasure of meeting Coach Few on several occasions during visits to Spokane, and he's a good guy who is not arrogant, but often sees things from his perspective only. It really helps that GU and BYU fly on chartered aircraft to and from there games and don't have to be concerned with airline schedules or passenger loads, but the rest of the conference is not rich enough to afford such luxuries. (I understand a SMC donor stepped-up to pay for the Gaels flight north yesterday). In 2009, due to canceled flights because of the Spokane weather, the Pilots did not arrive at the GU gym until after 4pm for a 7pm game. I don't remember hearing of any public complaining. jake wrote: I do understand his frustration. Anyone would be frustrated to travel for a game, be ready to play the game, and then have it canceled. That being said, I don't think he should have vented that frustration as he did. Anyway, good luck tonight. Take down the Gaels. Agreed on all points there... it's okay to vent, but Few needs to understand the larger responsibility/liability of the situation. 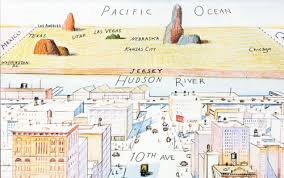 The perspective at GU regarding UP and most of the WCC is similar to the famous New Yorker cover showing how Manhattenites view the rest of the world. Up in their charter jet, UP is flyover country. PORTLAND, Ore. (PortlandPilots.com) – The West Coast Conference has announced a make-up date for the postponed Portland versus Gonzaga game originally scheduled for Saturday, January 7. The two teams will now meet on Monday, January 23 in Portland with tip-off set for 5 p.m. at the Chiles Center. The original contest was postponed due to a major winter storm sweeping the Pacific Northwest, which prompted multiple cancelations and closures in the City of Portland. The January 23 game is still sold out, but is expected to be televised. Broadcast details are being finalized and will be announced soon. Tickets purchased for the originally scheduled game will be honored on January 23. Fans that purchased tickets to the game but choose not to attend on the rescheduled date will be offered a ticket to another future Pilot home game of their choosing (based on inventory availability). Any unused game ticket can be redeemed for any remaining Portland home game at the gate of the game, or by emailing the Pilot Box Office at taylord@up.edu in advance. Below is the remaining men's basketball home schedule. To view Portland's ticket policies, click here. Because PDX traffic is so good that time of evening? Because it allows the Zags to fly home and get to bed at their normal time? Because there is a big dance already scheduled downtown for 8pm? Rumor is the league and the Pilots wanted the game played on January 30, but GU did not want a short week before playing at BYU on the following Thursday even though they could fly their charter flight home immediately after the UP game. Having the game on the 30th would have meant a lot less travel for the Pilots as they would have been home for 3 straight contests. As it is, the Pilots will play at USF on the 19th and at GU on the 21st before turning around to play them back-to-back on the 23rd at home before traveling to PU on the 26th. Hey, what's a little more missed class time?